As long as the user account control /UAC still works you need to go the hard way via "click right" and "achieve as admin". With a little trick it´s possible to avoid all the clicks in the context menu. Make these calibrations on both files. 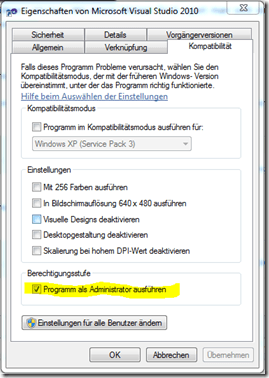 Without changing the UAC you will still have the "warning dialog" - otherwise you will be reminded every tame to start VS as an admin and you must not search for "run program as administrator". By the way: if you are used to develop desktop programs you should keep in mind that you program should be able to be achieved by normal users without admin rights as well.